The following footage was recorded during our parnaormal investigation of the reportedly haunted home located near the International airport in Miami, Florida on the evening of November 28, 2015. Paranormal investigators present were PRISM founder David Pierce Rodriguez and PRISM medium Gerard Leiser. This is our first orb-like anomaly recorded using the Kinect v2 sensor for Windows. The anomaly is not an insect, yet it does appear to cast a shadow. It also seems as if the orb-like object has a measurable mass. Could this be something paranormal? We'll let you decide for yourself. 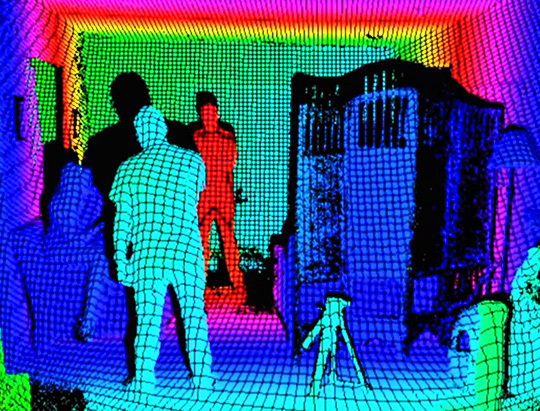 The Microsoft Kinect enables us to capture evidence of the paranormal through the use of an RGB camera and depth sensor (infrared laser projector & monochrome CMOS sensor). This provides us with full-body 3D motion capture, facial recognition capabilities, and skeletal tracking. On January 27, 2016, PRISM was mentioned in the official Microsoft Developer Kinect for Windows Product Blog in a post entitled 'Ghost hunting with Kinect' about using the latest Kinect sensor and SDK for capturing evidence of the paranormal. 3D audio spectrogram analysis of an EVP recorded while a young 10-month old child was speaking. Recording by Tanya D., while at home in her Miami International Airport area residence in Miami, Florida in October of 2009 on her Blackberry Curve cell phone. The audio begins with the EVP (3,000 - 4,000 Hz) followed by the child's voice (500 to 2,000 Hz) then another EVP followed by background chatter of the family speaking. A paranormal investigation is still needed to find out what exactly this spirit is. From the homeowner: "The other people a while ago heard it but at that time my kid was too small and I didn't want people in my house. I have water puddles from nowhere....my kid hears sounds. We have seen people. Many people have seen a person in my living room. They have. Quieted lately but every once in a while they show up. I don't think they are bad."